Lately we’ve noticed a lot of orders from customers who are getting ready for upcoming shows and exhibitions. It looks like the summer craft fair season is upon us! Many of our customers will be selling their greetings cards, MiMo Semi-Archival™ Prints and giclée prints across the country this summer. If this is your first year as a seller or you’re thinking about booking a table, we thought we would share some tips for selling your artwork and photography at craft fairs. It’s a good idea to plan and test how you will display your work. Practice setting up your table beforehand. Not only will this help you save time when you arrive, it will give you a chance to work out any issues you may have displaying your work. Make sure any display stands are sturdy and your prints or greetings cards are secure. Does your table still look good if you stand further back? If you sell a lot of smaller items, like A6 greetings cards or MiMo Semi-Archival™ mounted prints, passers-by may not see your artwork. Why not have a couple of larger giclée art prints or canvases for sale so browsers can see your work from a distance? Make your craft fair table look more interesting by adding height to your display. Your customers will be able to see more of your prints or greetings cards if they are not all on the same level. Perhaps you could re-purpose a cabinet or some shelves to help display your work? When you are selling your artwork or photography at a craft fair, you need to make your table stand out. Display your prints or greetings cards in an unusual or interesting way. The internet, Pinterest especially, is a great place to find ideas to display cards and decorate your table. But try not to get carried away! If your stand is overcrowded with props, browsers might not see your products or be too worried about knocking your stands over to have a good look at your greetings cards or prints. Don’t forget to take along some emergency supplies, such as glue, scissors or tape, to make any quick repairs to your display. Handmadeology has a comprehensive craft show checklist that’s worth taking a look at. If it’s an outdoor craft fair, remember to pack something to weigh down your cards or prints if it gets windy or something to cover them if it rains. Packaging your greetings cards in cellophane bags will help keep them in perfect condition. 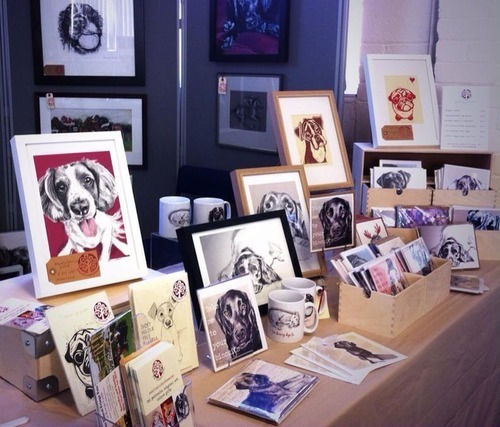 To maximise your sales at an art market or craft fair, make sure to offer a range of prices. Postcard prints, greetings cards or MiMo Semi-Archival™ prints are ideal for impulse buyers and browsers. Having one or two larger items on display, such as large giclée prints or a 20” x 30” canvas, might also attract serious art buyers. Don’t forget to take plenty of business cards with you in case your customers want to buy one of your larger prints or an original artwork at a later date.